Got those minivan blues? Afraid that driving a minivan means you’ve given up on style, sportiness and design? Well, stop worrying? The 2018 Chrysler Pacifica is the cure for the common minivan, with beautiful styling, great performance and clever interior features that will make you wonder why you didn’t go ahead on buy a Pacifica years ago! If you’re looking to buy a 2018 Chrysler Pacifica in Springdale, Arkansas, stop in today at McLarty Daniel Chrysler Dodge Jeep Ram Fiat of Springdale. We’ve got the 2018 Chrysler Pacifica in stock and ready to roll, and our friendly hometown deals make our prices second to none! Come see us today! DESIGN: Sleeker, more flowing and just better all around when it comes to exterior design, the 2018 Chrysler Pacifica is the minivan that makes you forget everything you know about minivans, with a sculpted profile and tasteful use of brightwork. There’s six trim models to choose from, ranging from the Pacifica L to the sporty Pacifica S, with special blackout trim package and a more aggressive look and stance. 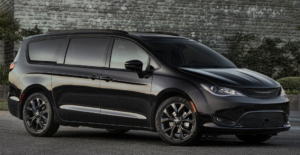 Available in eight beautiful colors, front the elegant Red Pearl to the eye catching Jazz Blue, to the classic Black Crystal, the 2018 Chrysler Pacifica certainly doesn’t look like any other small van on the road, which is doubly impressive when you find out it starts at just $26,995. PERFORMANCE AND CAPABILITY: More than just a pretty face, the 2018 Chrysler Pacifica features a high-tech powertrain that starts with Chrysler’s reliable 3.6-liter, 24-valve, Dual-Overhead Cam V6, which produces an exhilarating 287 horsepower and 262-ft.-lbs. of torque, for power and acceleration when you need it most while maintaining and EPA-estimated 28 miles per gallon on the highway and a best-in-class towing capacity of 3,600 pounds when properly equipped. Helping put that power where you can use it and keeping you sunny side up when the going gets slippery is standard electronic stability control which selectively applies braking and throttle control when hazardous wheel slippage is directed, allowing you to stay in command. SAFETY: Named a 2017 Insurance Institute for Highway Safety Top Safety Pick, the 2018 Chrysler Pacifica is in rare company, but it didn’t get there by accident. The 2018 Pacifica is built from the ground up to keep the safety of you and your passengers at the top of the list, starting with a frame and body construction that’s designed for maximum protection during a collision, including side-impact door beams made of high-strength steel. An array of advanced airbags surround you and your passengers in a near-360 degree curtain of protection, including dual-stage driver and passenger seat-mounted side airbags, and first, second and third row side curtain airbags. Those are only a few of the dozens of ways your new 2018 Chrysler Pacifica will keep you safe. Buying your average minivan might be a bummer, but not the 2018 Chrysler Pacifica! It’s packed with great styling, performance and engineering, plus the world-beating safety features Chrysler is known for. If you’re thinking you might buy a 2018 Chrysler Pacifica in Springdale, Arkansas, stop in today at McLarty Daniel CDJRF. We’ve got the 2018 Pacifica, and deals that are worthy of a handshake and a smile. Come see us, or shop our big selection online. Click here to contact McLarty Daniel CDJRF, or click here to visit our finance department.